Santa asked Siobhan McConnell to meet him at Kmart after his shift at the mall. It was 16 years ago; McConnell's husband had just abandoned the family, she said, and she had five children and no money. But she told Santa she didn’t need any help. She was fine. So after working eight hours at the Wayne Towne Center mall, greeting families and soothing angry babies, Ray Beesley changed from his red Santa suit into regular clothes and drove to a Kmart in Parsippany, where he bought Christmas gifts for each of McConnell’s children and slipped her a little cash. Beesley died on Dec. 2, at the age of 65. For thousands of families in North Jersey, he seemed like Santa Claus himself, a living embodiment of Christmas cheer and charity. He spent a few minutes with every child who sat on his lap, and devoted extra time to the disabled and the sick. Parents appreciated Beesley’s attention, so they waited in line for up to three hours to see him, first for 17 years at the Wayne Towne Center mall, which closed in 2008, and then at the Christmas Ice Caverns attraction at the Fairfield Garden Center. Sometimes, when a family was touched by death, an accident or some other tragedy, Beesley would get involved personally. One such family was McConnell's. Talking through tears, she told the story about how one kind gesture by Beesley blossomed into a close friendship that produced a lifetime of holiday memories. Things could have played out differently; Beesley had opportunities to go big. In 1998 he appeared as Santa on the “Late Show With David Letterman.” The following year Letterman invited him back, and Beesley was asked to move his Santa operation from the Wayne Towne Center to the busier Willowbrook Mall, where he could have seen more people and made more money. He turned both offers down, he told The Record, because they would have left him less time with the kids. The McConnell family first met Beesley in 1988 when her sister Yvette took McConnell’s oldest son, Michael, to see Santa at the West Belt Mall, as the Wayne Towne Center was known at the time. For 10 years McConnell and her husband bounced around, getting their pictures taken with Santas at different malls, until returning to West Belt in 1998 with their six children. McConnell’s husband refused to pay for a package of photos with Santa, however, insisting instead on taking pictures with his own camera. McConnell was ashamed of his behavior, and showed it. A year later, McConnell returned to the mall for her annual picture with Santa, newly divorced. McConnell, embarrassed, quietly told Beesley that her ex-husband had abandoned the family in November, weeks before Christmas. Beesley responded by paying for McConnell’s photos himself. The following year, Beesley offered to meet McConnell at Kmart. He bought one of her sons a Hot Wheels set, and a Bratz doll for her daughter. They exchanged phone numbers, and Beesley called a few times a year to see how the family was doing. Every year, McConnell’s picture with Santa served as the Christmas card she mailed to family and friends. Derek, McConnell’s second child, started making the annual trip to Santa’s chair in 1998, when he was 9. Years later, in December 2009, Derek was preparing to leave home for Army basic training. Beesley had served in the Army, McConnell said, so a few weeks after Christmas he called Derek. McDonnell doesn’t know exactly what the two men talked about. But she knows the call meant a lot to her son. “The two of them just bonded,” McConnell said. Absences for military service would become a recurring theme. In 2010, Michael was serving with the Navy off the coast of Israel at Christmas and couldn’t make the family’s annual visit with Santa. So McConnell brought a framed photograph of her eldest son in his Navy uniform for Beesley to hold in his lap for the annual portrait. On July 23, 2011, Derek was on patrol in Afghanistan when he stepped on a land mine. The blast destroyed both of his legs, mangled his right arm, left him with painful wounds in his lower back and caused traumatic injuries to his brain. Eventually he was transferred to Walter Reed National Military Medical Center in Maryland. Beesley tried to visit him there, but by the time Derek was stabilized enough to receive visitors it was the middle of the Christmas season, McConnell said, and Beesley couldn’t leave his family and his work as Santa. “It meant the world to me that he tried,” McConnell said. After that, McConnell said, she and Beesley talked often. Beesley called regularly, and they met for breakfast at the Original Pancake House in West Caldwell. They talked about Derek’s recovery and their families ― between them they had 11 children. McConnell is a lawyer, so she offered Beesley advice on how to advance his goal of creating a charity to help children in need. In return, she said, Beesley helped McConnell keep her faith. Both had been raised Catholics, but the breakup of her marriage and the difficulties of raising five children on her own strained McConnell’s faith beyond the breaking point. In December 2012, Derek was feeling well enough to leave the hospital in Maryland and travel north for his annual picture with Santa. He hobbled into the Fairfield Garden Center on crutches. Beesley, in his Santa suit, walked over and gave him a hug, McConnell said, and then introduced Derek to the crowd of waiting people. McConnell keeps the photograph from that day in a frame on her wall. It shows Beesley and Derek sitting on a love seat, smiling. Derek wore black cargo shorts, which showed off his silver prosthetic legs. Three months later, in March 2013, Derek died from complications from his injuries. McConnell called Santa, and they cried together. Even then, she did not call Beesley by his name. Every Christmas for the next two years, McConnell marshaled her surviving children for a trip to see Santa. Each time she handed Beesley a large picture of Derek giving the thumbs-up sign while on active duty in Afghanistan. Each time, McConnell wrapped her arm around Santa’s shoulder, and Beesley held the framed photograph in his lap. This year, Beesley and his family set up the Santa display inside the Fairfield Garden Center as usual, and he began welcoming kids on Nov. 7, before Thanksgiving. 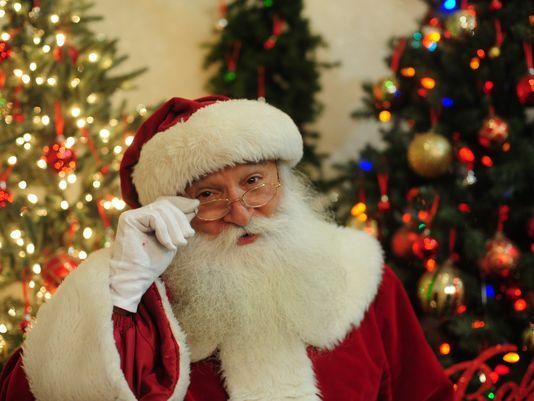 Beesley was so dedicated to his work that he came to the garden center Tuesday, Nov. 29, changed into his Santa suit and spent the entire day posing for photos with children even though he was feeling sick, said John Fernicola, the owner of the garden center. On Wednesday he stayed home. On Thursday he was admitted to a local hospital. On Friday, he died. The news was announced on Facebook, McConnell and Fernicola said. By noon on Dec. 2, the garden center’s phone was ringing constantly. Most callers were stunned parents, many of whom had missed their annual appointment with Santa. McConnell was one of them. She had tried to organize her kids to go see Santa, but they couldn’t find a date that worked for everybody. Within days of his death, Beesley’s family picked up where Santa left off, creating an account at gofundme.com to raise $15,000 toward establishing a charity for children. By Monday, more than 300 people had raised more than $14,000. On Facebook, Beesley’s admirers praised his dedication to children and Christmas.